The average U.S. consumer spends two hours and 42 minutes a day on mobile devices; 86 percent of that time is spent in apps and 14 percent is spent browsing the Web. The latest stats come from Flurry, an apps analytics and ad tools marketplace for developers. Only small increases were seen in mobile usage from last year (2.5 percent) when compared to major increases over the last five years, but mobile devices still command a large portion of consumers’ time at two hours and 19 minutes per day. 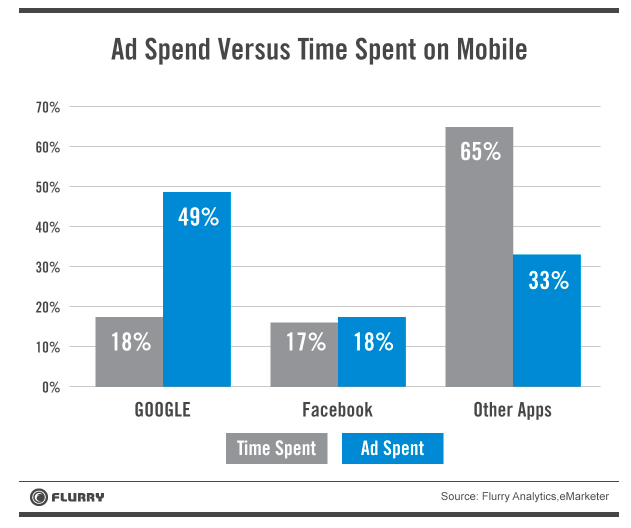 Apps dominate time spent on mobile, while time spent on the mobile Web continues to decrease. 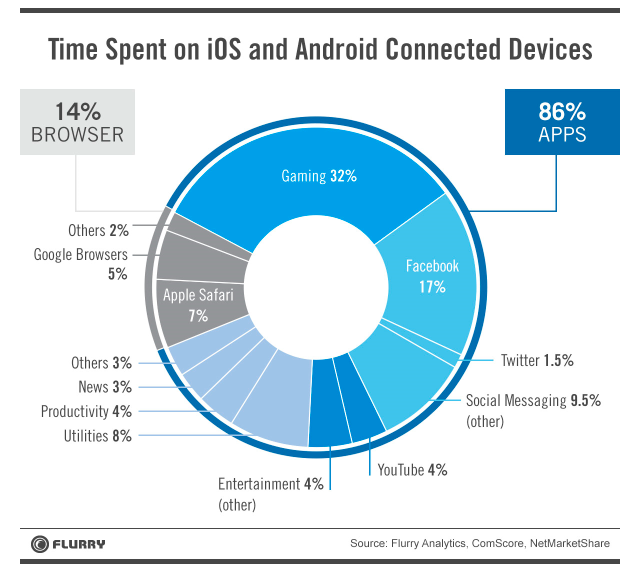 Gaming commands 32 percent of consumers’ app time. Social apps like Facebook and messaging increased from 24 percent to 28 percent. Entertainment apps maintained their position at 8 percent (half of that going to YouTube) and productivity apps doubled their share to arrive at four percent. In fact, Google and Facebook combined probably command less than 25 percent of the total time spent by the average US mobile consumer. In addition the top ten franchises, according to ComScore, account for less than 40 percent of the time-spent. So despite massive efforts by Google and Facebook, the market still hasn’t consolidated and over the past couple of years we have seen new franchises emerge in almost every sector of mobile. Apps like Pinterest, Snapchat, WhatsApp (acquired by Facebook), Waze (Acquired by Google), Spotify and many more received wide adoption and commanded a percent or two of the time spent. Interestingly, Google earned 49.3 percent of overall mobile advertising revenues, which is much higher than time spent by consumers using Google’s mobile products. Facebook’s 17.5 percent of earned mobile advertising revenue, on the other hand, is proportional to its share of consumer time-spent. eMarketer projects that the mobile ad market will grow 75 percent this year; the small share of advertising going to gaming apps and others represents huge opportunities for monetizing through advertising in those sectors.